After hearing that Diablo III would be featuring both genders for each class, we have been expecting a whirlwind of news to come pouring out. We were right. 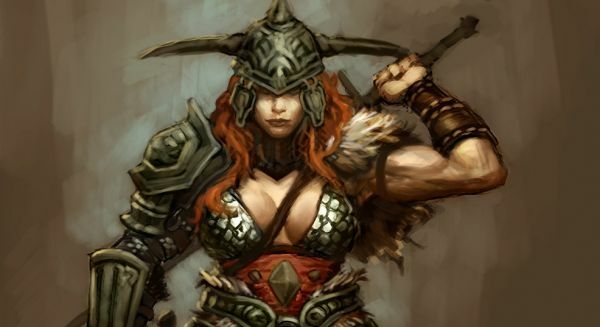 The Barbarian class has unleashed the first images of the female warrior, as well as a general profile for our enjoyment. Whirlwind - Used to devastate enemies that are close together with a spinning action. Heavy weapons add to the brutality, and you'll feel wholly satisfied with the result. Cleave - General heavy attack for the Barbarian class, cleave is handy for those one-on-one encounters. Ground Stomp - Used to stun enemies surrounding your Barbarian, any in the shock wave range will stand dazed for several seconds while you wander around and cleave some baddies. Leap - For far off foes that just need to be dispatched. The Barbarian can leap awfully far considering her massive size, and the enemies won't even know what hit them. Seismic Slam - Used when enemies run toward your Barbarian in a somewhat-straight line. The enemies will be hit with a column of energy, causing sizable casualties quickly and effectively. As we get more information about the new classes, and gender features, you can be sure we'll have it here for you. We just can't wait to play the finished version. Seriously.